Committee to be held in Tokyo. This month, the ICO Strategic Planning Committee will hold its second meeting under the leadership of ICO President, Duncan Moore. The first meeting dealt with identifying ICO’s strengths and weaknesses. Its most highlighted strength was its truly international character. What do we mean by that? The ICO is a non-governmental organization with a global membership of 50 national or regional scientific bodies named Territorial Committees (TCs) and six International member organizations. ICO is an Affiliate Commission of the International Union of Pure and Applied Physics (IUPAP) and an International Scientific Associate of the International Council of Science (ICSU). ICO is not a technical society, and unlike its member societies, ICO does not have individual membership: ICO Territorial Membership requires the existence of an organization that represents the optics community in the territory. Prospective Territory members need to demonstrate the existence of a structured organization (network, society, academy of sciences, etc) that gathers the local community of researchers in optics and that performs regular activities in optics. With these requirements, ICO has actively promoted and supported the creation of the Portuguese Optics and Photonics Society and the Armenian Territorial Committee, the two most recent ICO members, which have clearly demonstrated major activities in support of optics education and research. Members of the Armenian Territorial Committee thanked ICO for urging them to local interaction and collaboration in order to create their TC, and for the increased global visibility of their research community through their ICO membership. Optics and photonics have become an enabling science that provides tools and advanced technologies for a multitude of disciplines, ranging from space-terrestrial sciences and telecommunications to biology and medicine. The fact that ICO’s scientific activities do not fall primarily within the scope of a single ICSU Scientific Union Member enabled ICO to become an International Scientific Associate of ICSU. Schematic representation of ICO/ IUPAP/ICSU interconnections.Schematic representation of ICO/IUPAP/ICSU interconnections. But, what is ICSU? 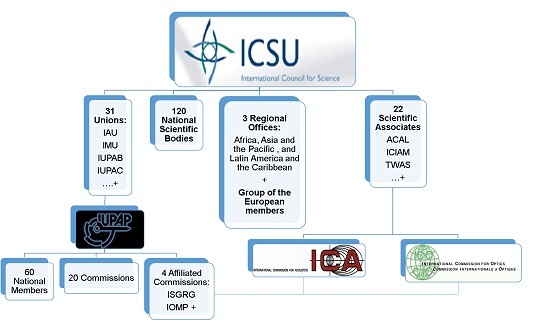 ICSU is a non-governmental organization with a global membership of 120 national scientific bodies and 31 International Scientific Unions, one of them the IUPAP. ICSU facilitates interaction amongst scientists across all disciplines, including the humanities and engineering. ICSU’s cross-disciplinary approach fits well the character of ICO as a community embracing scientists and engineers, and extends the possibilities of ICO outreach to social scientists to increase the impact of ICO activities on society. The mission of ICSU is to strengthen international science for the benefit of society. Its long-term strategic vision is for a world where science is used for the benefit of all, excellence in science is valued, and scientific knowledge is effectively linked to policymaking. Along these lines ICSU works with strategic partners to plan and co-ordinate international research programmes that address major issues of relevance to both science and society. A clear recent action in this regard is ICSU’s partnership in the 10-year Future Earth research initiative, a science and technology alliance for research for global sustainability that offers a general framework for research on sustainable energy and hence on solar energy, one of the areas of great activity in optics and photonics for the near future. ICSU works at the intersection of science and policy, to ensure that science is integrated into international policy development and that relevant policies take into account both scientific knowledge and the needs of science. ICSU promotes dialogue and shared understanding between the scientific community, policymakers and society more broadly. ICSU is also involved in a number of external activities as a representative for the scientific community (e.g. UN Commission on Sustainable Development, Rio+20 Earth Summit in 2012). To work at the intersection of science and policy seems to me a valid strategy for future ICO activities. ICO’s mission, “to contribute, on an international basis, to the progress and diffusion of knowledge in the field of optics”, should, following ICSU’s vision, be extended to the promotion of dialogue and understanding between the scientific community, policymakers and the society, in order to awaken awareness of the relevance of optics and photonics in our lives, and to broaden the impact of optics and photonics-based technologies for the benefit of the civil society and the achievement of sustainable development. Within this framework, ICO should define its own priority research programmes, create committees involving its Territorial Committee Representatives, and support the actions of Territorial Committees with their local authorities for the achievement of ICO goals. Fifteen years ago, John Howard, ICO treasurer 1984–1987, suggested that ICO was perhaps mature enough to become an ICSU Union. Today the threat posed by rapid climate change calls for the co-ordination of activities between the scientific community policymakers. ICO could join ICSU in this endeavour and find within ICSU a proper niche in which to expand its activities and international political influence. The ICO Secretariat has launched within its Territorial representatives a survey consisting of 10 questions about ICO members’ perception of ICO’s present value and projection into the future. Your answers will be valuable in the deliberation on ICO future goals and strategies by the ICO Strategic Planning Committee. After two decades the ever-growing Iberian-American conference returns to the Iberian Peninsula. The RIAO/OPTILAS triennial series is the most important conference bringing together researchers from Central and South America and the Iberian Peninsula. The series was born from a Latin American initiative for a meeting on lasers and applications, which was held in Colombia in 1984. On occasion of the 500th anniversary of the arrival of Columbus in America, Spanish researchers organized in 1992 the RIAO conference in Barcelona, Spain. In 1995 RIAO and OPTILAS were organized in Mexico and Cuba respectively, causing an unnecessary split in the attendance of the Iberian American research community. In 1998, ICO’s Past President, Ana Consortini, initiated negotiations between Argentina and Colombia that resulted in a joint conference in Cartagena, Colombia. This conference was chaired by the current ICO Secretary, Angela Guzmán. The conference has been held twice in Argentina, Brazil and Mexico; once in Spain, Cuba, Venezuela, Peru, and Colombia; and this year, after two decades, it has returned to the Iberian Peninsula, to be organized by the recently created Portuguese Optical Society. Young Scientist Prize in Optics 2012.
conference and President of SPOF). The VIII Reunión Iberoamericana de Óptica / XI Reunión Iberoamericana de Óptica, Láseres y Aplicaciones-VIII Reunião Iberoamericana de Óptica/XI Reunião Iberoamericana de Óptica, Lasers e Aplicações, RIAO/OPTILAS 2013 ran very successfully. 441 participants from 39 countries openly shared ideas and experiences, discussing the remarkable and exciting developments of the last three years in optics in Iberoamerica. 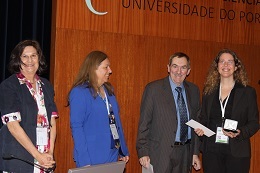 The conference was held 22–26 July at the University of Porto in Portugal. 21 years after the first Iberoamerican Optics Meeting (Reunión Iberoamericana de Óptica–RIAO) in Barcelona, the principal meeting of the Iberoamerican optics community returned to the Iberian Peninsula. It was the greatest of honours for us, the Portuguese Society for Optics and Photonics (SPOF), to welcome colleagues from all over Iberoamerica and to see Portugal renewing friendships and growing many more. The success of the conference was only possible with the active support and commitment of the Red(e) Iberoamericana de Optica, the Spanish Optical Society, SEDOPTICA, the Mexican Academy of Optics, AMO, the Colombian Optics Network, RCO, the Venezuelan Optics Committee, CVO, and many colleagues and institutions from all over Iberoamerica. The endorsement and active support of the most important international scientific optics societies – ICO, SPIE, and OSA – represented at the highest level, and of several major institutions – Photonics’21, EOS, LAM, SECPhO, EPIC – and national societies committees and boards: STO, OPSS, APLO, SPF, FCT, as well as of the SPIE and OSA student chapters of the University of Porto and the University of Aveiro, INESC and the University of Porto was fundamental and greatly appreciated. From the 605 works accepted, 581 were presented. 13 high-level plenary lectures were presented, along with 61 keynote lectures covering all fields of optics and photonics, 135 oral communications and 372 posters. There were 441 participants in all, including over 158 students, from 39 countries from all over Iberoamerica and the world. 249 full papers were accepted for publication in the proceedings book, to be published by SPIE in November. Two very interesting special sessions and round tables on “Entrepreneurship in Optics & Photonics” and “Women & Optics” were organized with strong active participation of the audience. These sessions were jointly organized in the frames of RIAO/OPTILAS2013 and of ETOP2013. The 12th Education and Training in Optics and Photonics Conference was very successfully organized in parallel with RIAO/OPTILAS’2013. The participation of students (158) and young researchers was very positive and a sign of the growth potential of our Iberoamerican O&P research. SPIE and OSA student prizes were awarded, and there was a ceremony for the awarding of the IUPAP Prize 2012 to Nirit Dudovich, Weizmann Institute, Israel, for her work “Resolving and manipulating attosecond processes via strong-field light-matter interactions”. The board of the Red(e) Iberoamericana de Optica meet during the conference and Prof. Dr Pedro Andrés Bou was sworn in as new president. The recent activities of the red(e) and very positive prospects for evolution were presented during the general assembly of RIAO/OPTILAS. RIAO/OPTILAS, the reference meeting in Optics in Iberoamerica and our main "window" to the world, will keep growing and re-enforce itself. The next edition, to be held in Chile the fall of 2016, will be another great success reflecting the decisive importance of Iberoamerican contributions to the development of Optics and Photonics. Students of the SPIE Chapter contributed greatly to the excellent organization and social activities of the conference. Here with panelists of the round table on “Entrepreneurship in Optics & Photonics”, Eric Rosas, Duncan Moore, Gerd Haeusler, and Eugene Arthurs. Manuel Filipe Pereira da Cunha Martins Costa Universidade do Minho, Braga, Portugal, 29 July 2013. The leading international conference on education and training in optics held in Porto with record attendance. Citation by Maria L Calvo at the ETOP opening ceremony, extracted from the July 2013 speech to the United Nations by 16-year-old Pakistani education activist Malala Yousafzai. In October 2012 Yousafzai was shot in the head and neck in an assassination attempt by Taliban gunmen because of her promotion of education for girls in Pakistan. 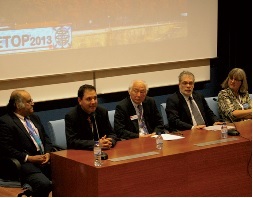 Inauguration of ETOP 2013. From left to right: Vasudevan Lakshminarayanan, Mourad Zghal (Chair), Mitsuo Takeda, Pereira Leite and Donna Strickland. Donna Strickland (OSA President) and Duncan Moore (ICO President) dancing at the conference dinner. The teaching of optics and photonics, critical fields at the core of today’s scientific and technological infrastructure, must continually be upgraded and renewed in order to meet the growing demands of research, science and industry for the sake of the sustainable development of our world and humankind. The International Conference on Education and Training in Optics, known as ETOP, is the principal conference that brings together the international community of optics and photonics educators, leading optics and photonics scientists, academia, and industry, from all around the world to share experiences and knowledge, to discuss, demonstrate and learn about new developments and approaches to teaching in these fields. Through presentations, panel discussions, workshops and exhibits, it is the intent of this conference to inform professors, students, teachers and professional trainers on how to promote the learning of optics and photonics for the future. Since 1988, SPIE, the International Society for Optics and Photonics, and OSA, The Optical Society, have sponsored the ETOP conference. The first meeting, initiated by SPIE’s Academic Advisory Committee, focused on undergraduate- and master’s-level programmes in optics and related fields, the supply and demand for graduates, and academia–industry interaction. The first ETOP was held in conjunction with SPIE’s annual meeting in San Diego. It brought together scientists, technicians and educators to discuss educational programmes and the opportunities and challenges for graduates. The second conference was held in 1991 in St Petersburg, Russia, for which the ICO joined the founding organizations as a co-sponsor. From there, ETOP became a biennial meeting that has been held in Pecs, Hungary (1993); San Diego, California, USA (1995); Delft, the Netherlands (1997); Cancun, Mexico (1999); Singapore (2001); Tucson, Arizona, USA (2003); Marseille, France (2005); Ottawa, Ontario, Canada (2007); and St Asaph, Wales (2009). The 2011 conference was scheduled to be held in Tunisia but was cancelled by the ETOP Long Range Advisory Committee because of the civil unrest in the region. ETOP 2013 was then held 23–26 July in the beautiful city of Porto, Portugal, sponsored by SPIE, OSA, IEEE, and ICO. It was jointly organized by the Portugal and Tunisia Territorial Committees of the ICO. Conference chairs were Prof. Manuel Filipe P. C. Martins Costa of the University of Minho in Portugal and Prof. Mourad Zghal of the University of Carthage in Tunis, Tunisia. The event was collocated with RIAO/OPTILAS 2013. Additionally, the conference served as a forum for representatives from academia and industry as well as students to interact and build bridges. The different sessions provided the framework of wider discussions on how to improve education, training and teaching in the field of optics and photonics. Indeed, the four days were buzzing with lively discussion and debate – not only during the interactive sessions, but also around the coffee tables. We would like to express our thanks to our host, the Science Faculty of the University of Porto, for providing its premises, technical equipment and ever-helpful staff. And last, but certainly not least, we wish to thank wholeheartedly all contributors and participants of this event for making it an informative as well as enjoyable event. Conference chairs, Prof. Manuel Filipe P. C. Martins Costa (University of Minho, Portugal) and Prof. Mourad Zghal (University of Carthage, Tunisia).